I had to cut back my pepper plants to day so I have a few peppers that I picked off. I have some Jalapeno, Serrano, super chili, and thai chili. Some are red but most are in the green stage. Got any recipes or methods to keep them? I can make chili pepper water, but that would take two peppers. Fenadeni will take two and Vinha D'alhos will also take two. I have too many left. Got any recipe for hot pepper sauce? If I freeze them, will they get mushy when they are thawed? Lots of people around here make hot pepper jelly. I like spicy, but I'm not as big a fan of super hot as some and I don't grow hot peppers. This year I did make some bell pepper jelly into which I mixed a bit of hot peppers, not enough to make it really hot, but made it a little more tangy. It came out really good! I haven't frozen peppers until this year. I have a bunch of chopped, frozen bell peppers in my freezer, but haven't pulled any out to use yet. I'm expecting that they will be softer, less crisp, but not necessarily what you would call mushy. I have not tried to make jelly before, but I have had had pepper jelly. It might be something to look up. I ADORE hot pepper jelly! I make lots and lots. We eat it with cream cheese and crackers at holiday gatherings. I also give it away as gifts. Friends and family beg for it! I make 3 kinds. I follow the recipe for cooked pepper jelly on the inside of Certo liquid pectin, but substitute some of the peppers. It usually calls for almost 3 ( I think it's actually 2 3/4 cups, but I've fudged it without issue) total cups of peppers. I usually do half sweet pepper and half hot pepper. So, for green pepper jelly I use 1.5 cup finely chopped green bells and 1.5 cup finely chopped hot green peppers. I think jalapeÃ±os have a real nice flavor. For red pepper jelly I use 1.5 cup red bell and 1.5 cup ripe red hot peppers. I use seeds and all for jalapeÃ±o jelly. For Habanero pepper jelly, I use 2.5 cups yellow or orange bell peppers and .5 cup chopped SEEDED habanero peppers. The recipe calls for food coloring, but I think the look VERY Charming on their own. Also here is the official recipe for Certo brand hot pepper jelly. I like using liquid pectin because IME I get a firmer set. Last year I made a spicy strawberry jam with ripe jalapeÃ±o peppers and cracked green peppercorns and balsamic vinegar. I'll look for it and post it! 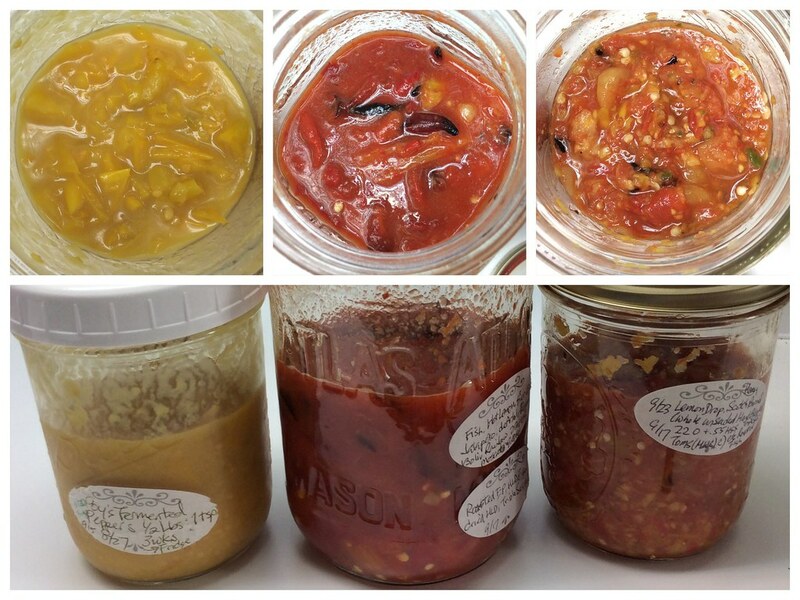 I'm trying making two kinds of fermented pepper sauces. These are first tries so I won't know how I feel about them until they are finished. The yellow one on the right uses a simple wild fermentation technique with just the chopped peppers and a bit of salt that I just learned about. Both will ferment on the counter for about 3 weeks, then will be stored in the fridge (to age) until they can be food milled/strained if needed, and vinegar, etc can be added according to recipes. Finished products from these recipes are not properly tested for canning and need to be frozen or kept in the fridge to be used up in a couple of months. Or you could pressure can them in small jars! I recently treated myself to a pressure canner. I told myself that my old pressure cooker needed to be retired anyway and I can use it for making Portuguese soup anyway. I have never canned anything before, so it may be awhile before I have the nerve to try it. My favorite thing to pressure can is roasted red peppers. I char the skins, let them steam in a bowl, remove the skins, and then pack them in jars and pressure can! They are SO good in pasta dishes and antipasti dishes with cheese and all kinds of other yumminess! The one I have wasn't expensive! There are very expensive ELECTRIC DIGITAL ones, but I like the control I get with my simple one. It's very easy to use! I was worried at first about the pot exploding, but that was just an irrational fear... As long as you follow the directions, you can't go wrong. This is the time of year when people start having more peppers than they know what to do with. I have an abundance of anaheim chilis, but they aren't very hot, not hot enough to powder like cayenne. Uses for peppers: dry and grind, freeze, pickle, add to most thingsyou cook, including chili cabbage slaw, chili chicken soup, etc, green curry paste, chili paste, pepper jelly. And you can make a pain relieving ointment from them. Dry and powder the peppers. Heat with oil (grapeseed, almond, jojoba, etc) in double boiler, then add beeswax and melt together. Chill for awhile then whisk and then repeat chilling and whisking and then jar up. Works like ben-gay or icy hot. I made some guacamole the other night and I put several jalapeÃ±os in it. In the shower later that night, the tips of my fingers were on FIRE! I guess some of the juice got under my fingernails and didn't wash off. My peppers aren't even hot this year, but they were still burning several hours later! Mine are really wimpy this year.... They are deliciously sweet though with that nice jalapeÃ±o flavor, just very, very mild. I was sure those yellow peppers would never be covered in "their own" liquid as the recipe/instructions indicated, but sure enough. The full quart jar (1/2 Lb) of diced peppers has reduced to something like 6 fl. oz. When 1/2 the quantity of vinegar is added at the end, it will most likely make 8 fl. oz. of hot sauce. I'm going to put the yellow ones in a smaller jar and put an airlock on it. But I think I'll give the Louisiana style a little longer to ferment. I started a batch of fermented red peppers to make into Sriracha sauce. I didn't have enough so I'm just going to keep adding to the jar as the peppers ripen. For this one, I took a middle road and added a couple of table spoons of Moscato wine. I also added a piece of the roasted Etkezesi Paprika. Wow Apple you are so talented. What to do with Anaheim peppers? What to do with hot banana peppers?